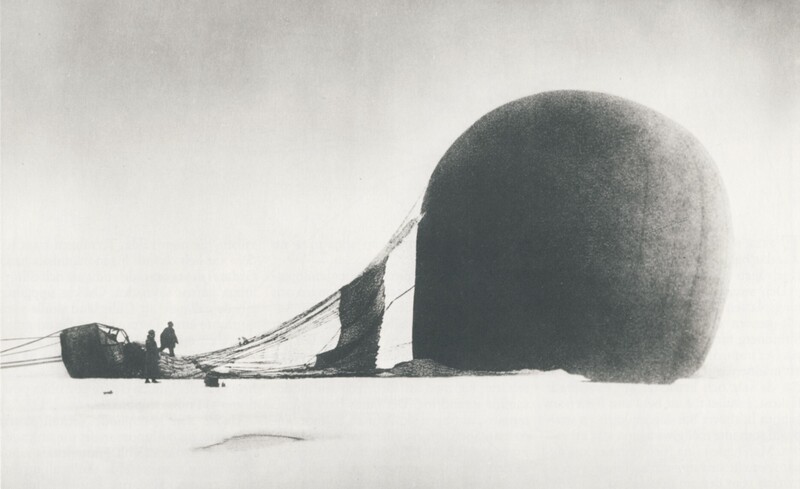 14 July 1897: At 8:11 p.m., G.M.T., the Andrée Arctic Expedition’s hydrogen gas balloon, Örnen (Eagle), came to rest on an ice floe in the Arctic Ocean, at N. 82° 52′, E. 29° 32′. ¹ This was the end of a planned transpolar flight and the beginning of a three-month struggle for survival. 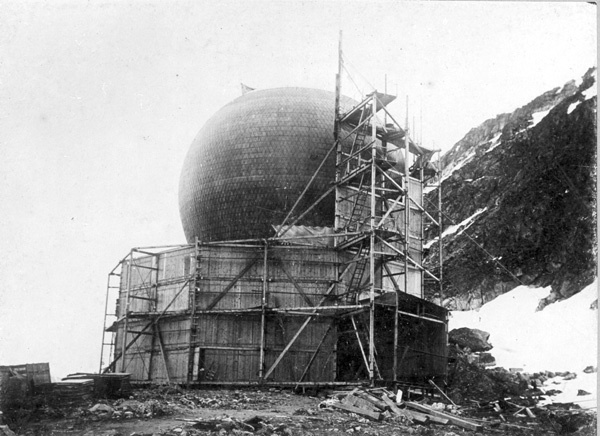 At 1:50 p.m., 11 July 1897, Örnen rose from its protective enclosure on Danskøya (Danes Island) in the Svalbard Archipelago of Norway. 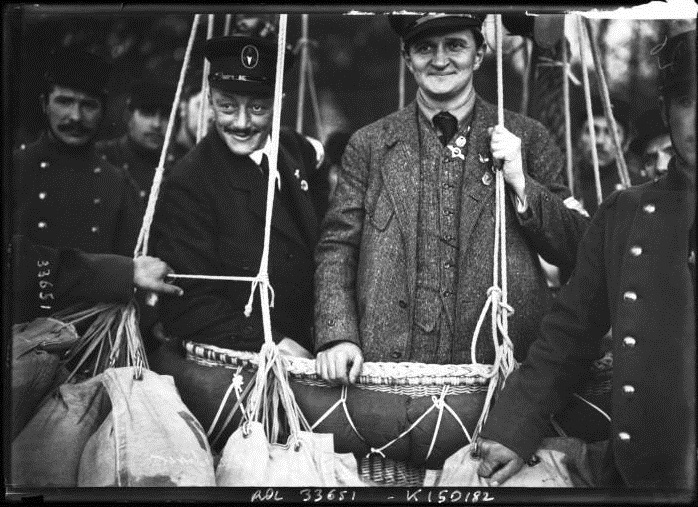 Carried aloft in the balloon’s gondola were the expedition’s leader, Salomon August Andrée, and his fellow explorers, Knut Hjakmar Ferdinand Frænkel and Nils Strindberg. The goal of the expedition was to fly across the North Pole and onward to Alaska on the North American Continent. 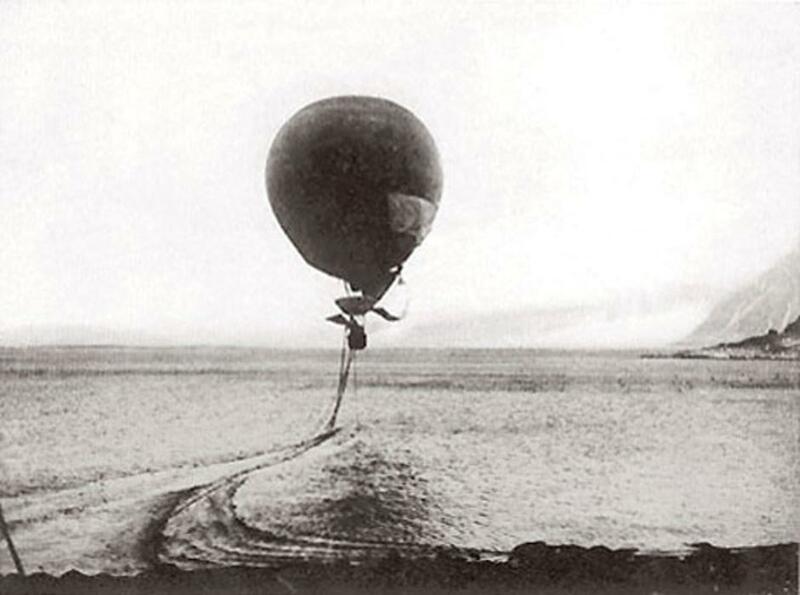 Andrée considered that the balloon would need to retain enough gas during the voyage to remain airborne for 30 days. Supplies for the three men for that period were carried. 36 homing pigeons would allow the explorers to report their progress to the outside world. This would be the expedition’s second attempt. 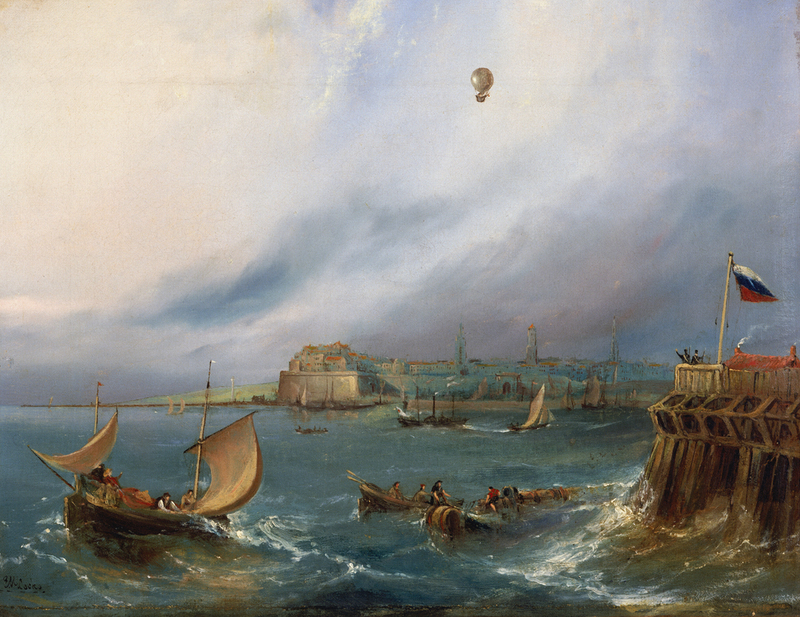 The previous year, adverse winds forced the aeronauts to abandon the flight. Örnen had been designed and manufactured by Henri Lachambre at his balloon factory at Vaugirard, a suburb on the Left Bank of the Seine, Paris, France. The envelope was assembled from approximately 3,360 pieces of a thin woven Chinese silk fabric called pongee, stitched by hand. The seams were covered by glued strips of pongee. The upper two-thirds of the gas bag had three layers of fabric, while the lower one-third had two plies. It is estimated that 8 million stitches were required. Once completed, the envelope was covered with varnish. The gondola was constructed of wood and wicker. It had an upper, observation, deck, and an enclosed lower sleeping quarters/darkroom. A net made of more than 300 hemp ropes covered the balloon, and were braided into twelve ropes which were attached to a lifting ring. The gondola was suspended below this. 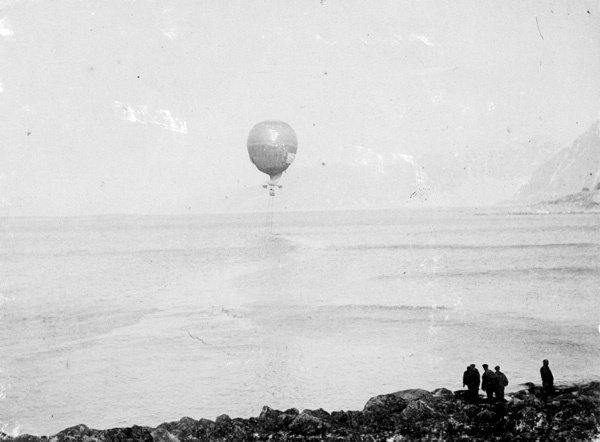 At Sea Level, the inflated balloon with its gondola were approximately 97 feet (29.6 meters) high, and 68 feet (20.7 meters) in diameter. Its total volume is estimated at 4,800 cubic meters (approximately 170,000 cubic feet). Balloons have a disadvantage in that they go where the wind takes them. They are not steerable like dirigibles. So, steady southerly winds would be needed to carry Örnen to the North Pole, and northerly winds to travel from there to Alaska. Andrée had a theory that he believed would allow him to steer his balloon as much as 30° to either side of the prevailing wind. Andrée’s idea was that if several long, heavy ropes were dragged behind the balloon, their weight and friction would cause the balloon to travel slower than the wind was blowing. He could then use two small sails to steer. Örnen with guide ropes dragging in the water. Also, these ropes could be used to control the balloon’s altitude. By pulling the ropes in, the weight supported by the balloon would increase, and it would descend. Letting more rope out would mean that the extra weight would be transferred to the surface, and the balloon would rise. Altitude was critical. Andrée planned to maintain about 150 meters (approximately 500 feet). As the balloon ascended, atmospheric pressure on the envelope decreased. The pressure differential between the atmosphere and the hydrogen would increase, forcing the hydrogen to pass through the envelope more quickly. Any hydrogen loss was permanent, and the balloon’s buoyancy would decrease. Problems began immediately. As the guide ropes dragged through the water, they became heavier. They pulled the balloon down to the surface and the gondola actually touched the water. 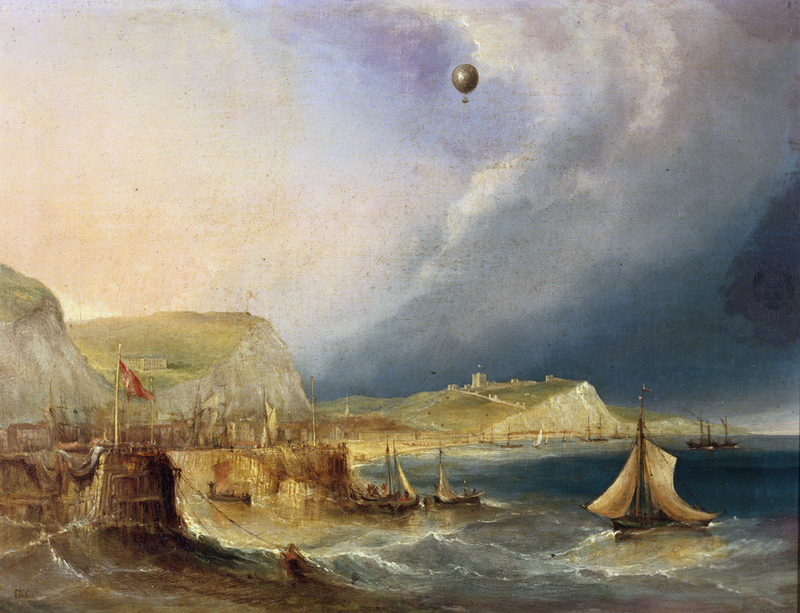 The aeronauts frantically began dumping ballast. Three of the four ropes became entangled and were pulled loose. Örnen began to rise again, but having lost ballast and the weight of the three guide ropes, it climbed to about 1,600 feet (490 meters). The loss of hydrogen accelerated. The Eagle floated northward above a fog bank. It sank into the fog and sunlight shining on the envelope decreased. The balloon cooled and the gas inside began to contract. Buoancy decreased and the balloon sank further into the fog. An alternating pattern of rising and falling developed. After the explorers passed into the Arctic ice pack, the gondola would alternately bounce across the broken ice, then rise again into the sky. At about 10:00 p.m., July 12, the gondola settled on to the ice and remained there for the next thirteen hours. 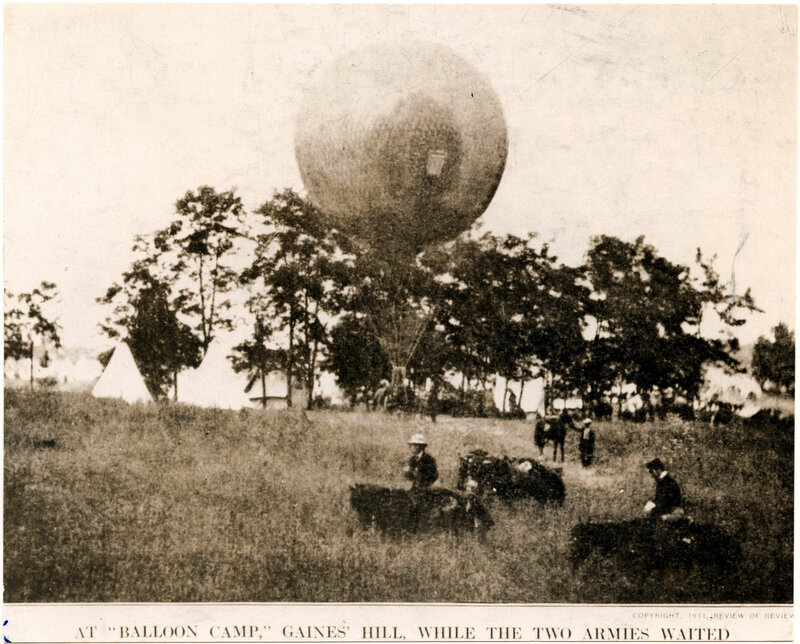 At 10:55 a.m., 13 July, once again airborne, the balloon continued on its flight. Drizzle and fog caused ice to form on the envelope. The gondola dragged behind. After jettisoning hundreds of pounds of ballast and equipment, Örnen rose higher, but again settled toward the ice. The remaining guide rope was lost. Realizing that the end of the flight was inevitable, the crew opened to valves to release the hydrogen. 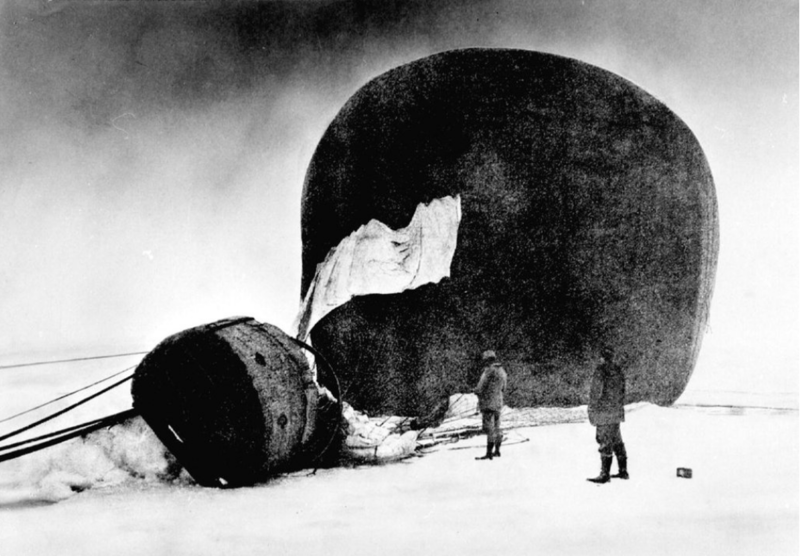 The balloon settled to the ice, and at 8:11 p.m., 14 July 1897, the crew climbed down from the gondola onto the ice floe. The total elapsed time of the journey was 65 hours, 35 minutes. 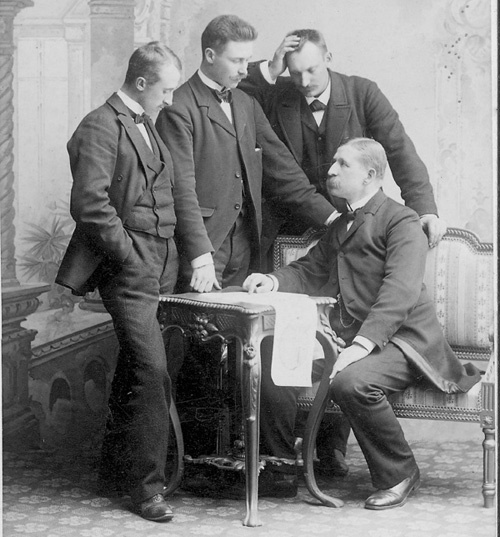 In that time, Andrée, Frænkel and Strindberg had traveled 295 miles (475 kilometers) from their starting point on Danskøya. The next three months were a courageous battle for survival as the three explorers tried to make their way back to civilization. They reached Kvitøya (White Island), an ice-covered island at the northeast of the Svalbard Archipelago. Andrée’s final journal entry was made on 17 October. The bodies of the three men were discovered in 1930. Their remains were taken to Sweden. There is much speculation as to the cause of their deaths, ranging from exposure, exhaustion, illness, suicide, or bear attack. 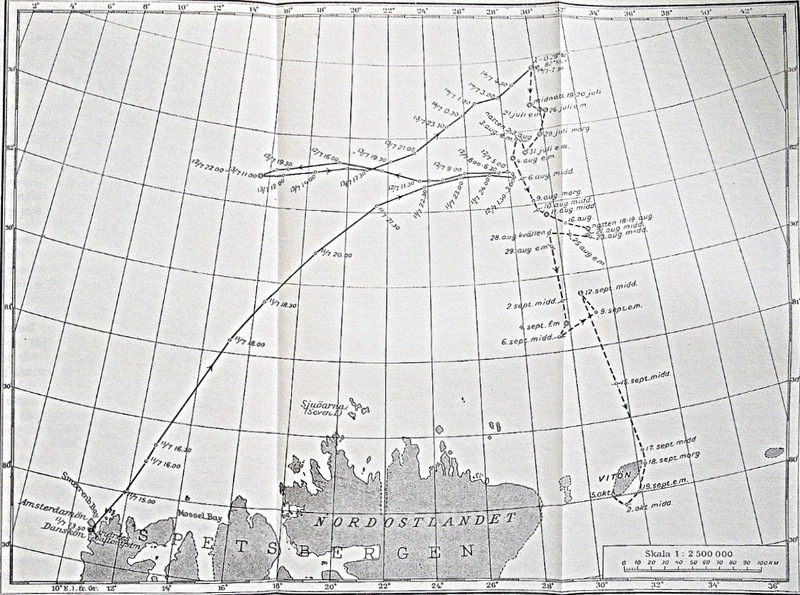 Track of the 1897 Andrée Arctic Expedition. 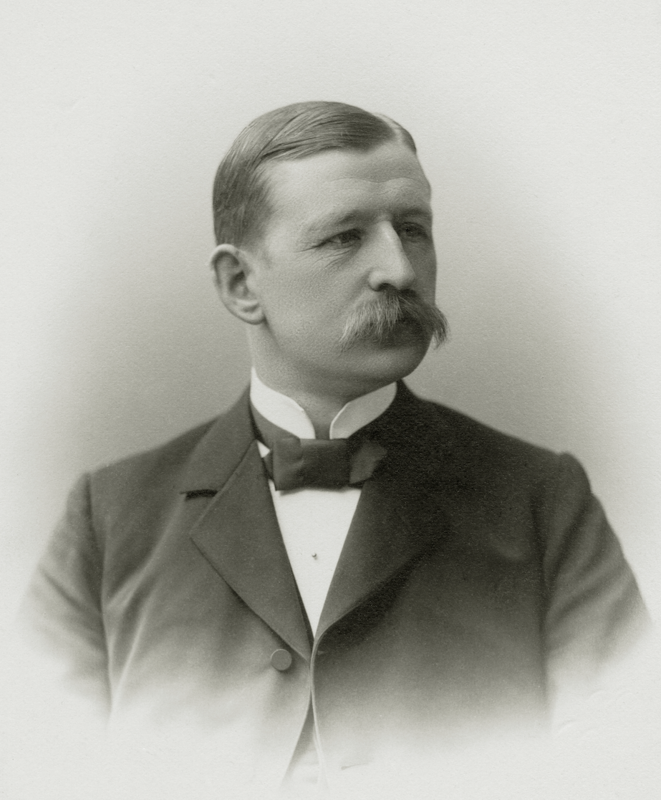 The expedition left behind journals with detailed meteorological data and other observations. More than 200 photographic images were left on film negatives protected in metal canisters. 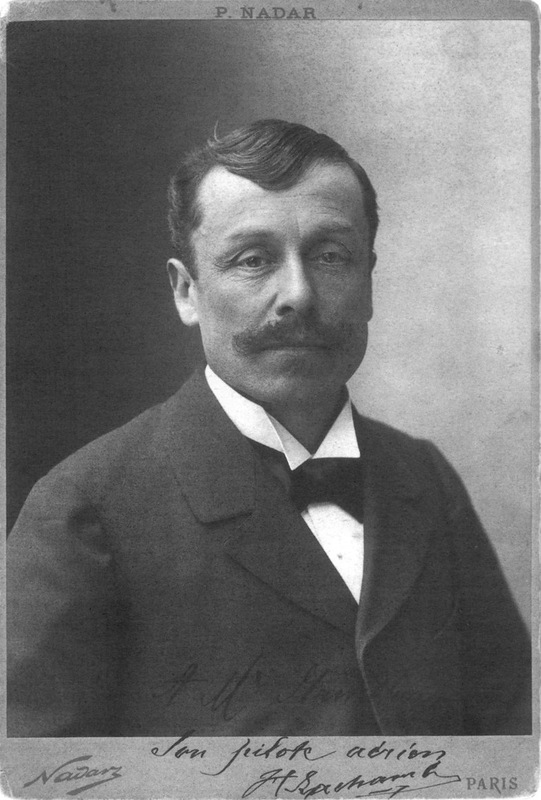 The 1897 Andrée Arctic Expedition is the subject of books, newspaper and magazine articles, at least one motion picture, as well as many Internet articles of varying detail. The images taken by Nils Strindberg are available on the Internet and tell of their experiences. ¹ Geographic location of Örnen‘s landing site from the Comité International d’Aérostation (CIA, the Fédération Aéronautique Internationale Ballooning Commission). 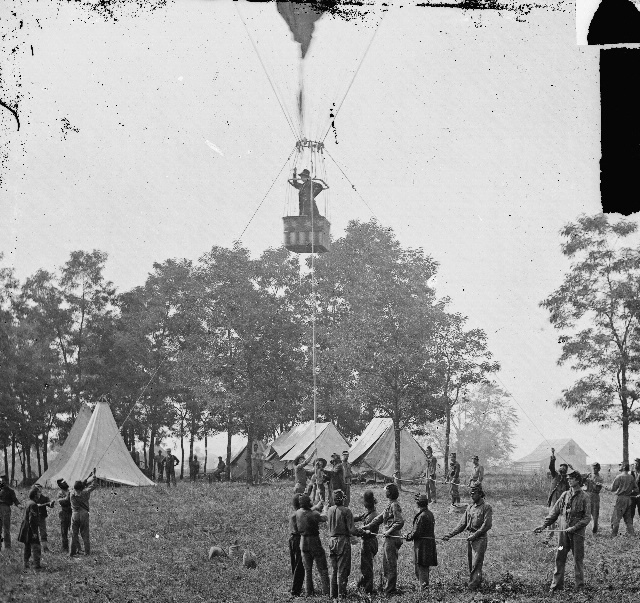 29 May–1 June 1862: Thaddeus Sobieski Constantine Lowe, commanding the civilian Union Army Balloon Corps, relayed observations of enemy troop movements, both vocally and by telegraph, from the gondola of a hydrogen balloon which was moored on the north side of the Chickahominy River of eastern Virginia during the Battle of Seven Pines, which took place during the American Civil War (1861–1865). 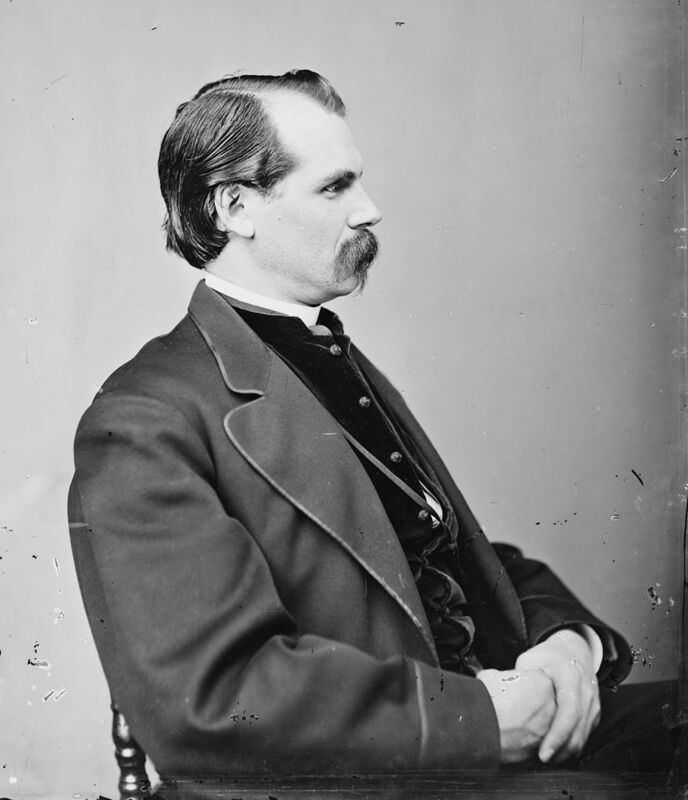 Having been appointed Chief Aeronaut by President Lincoln, Lowe had previously performed aerial reconnaissance at the First Battle of Bull Run, 21 July 1861. He was also present at the battles of Sharpsburg and Fredericksburg.